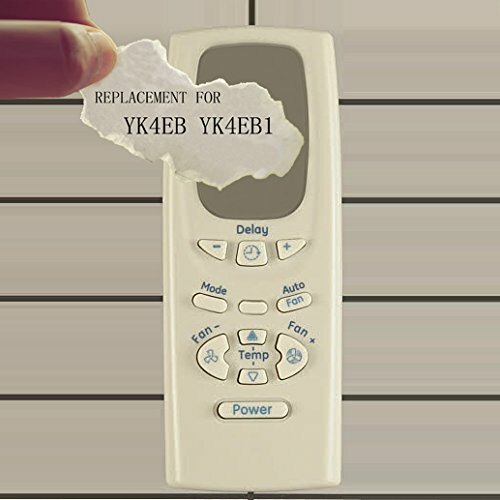 NOTICE: IT IS ONLY COMPATIBLE FOR GE REMOTE CONTROL PART NUMBER"YK4EB" "YK4EB1"
,ALSO IT IS NOT A UNIVERSAL GE Air Conditioner REMOTE CONTROL. 1. This Model list may not be a complete list.maybe other GE air conditioner can use this remote control. Cool air control with a remote. When my factory remote died I was put out by having to manual turn on and off the air conditioner. This replaces the factory and it is spot on, quality and working flawless! Popped the batteries in the remote and worked like a champ! Thanks for 50% discount!worked perfect.